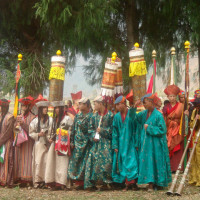 Insights of age old tradition of festival. Local markets, farm houses, schools and opportunity to meet and interact with local folks. 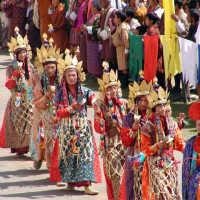 Bhutan Festival Tour is a 8 nights/ nine-day leisurely-paced tour that takes on at least one or multiple colourful festivals in this magical Kingdom . 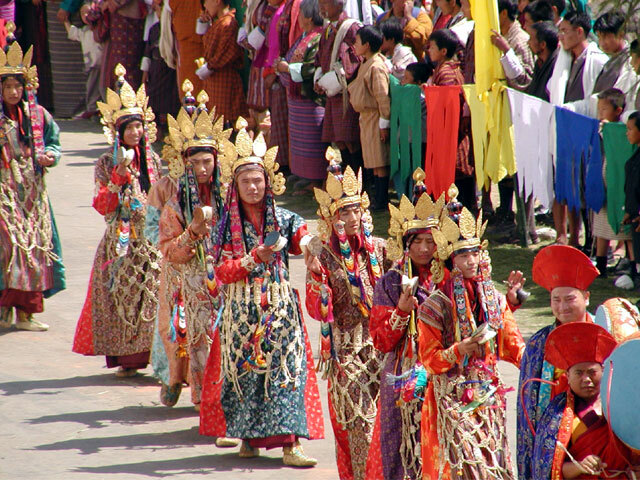 Bhutan Festival takes one or multiple of Bhutan’s most colourful and popular festivals. 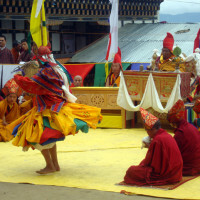 Bhutan’s festivals are joyous expressions of its Buddhist culture. It offers Bhutanese an opportunity to become immersed in the meaning of their religion, as well as being an occasions for seeing people and being seen. 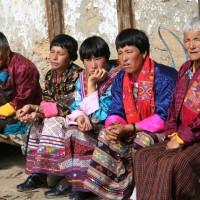 People wear their finest traditional clothes, put on their most beautiful jewellery, bring delicious picnic lunch and join in the festivities. 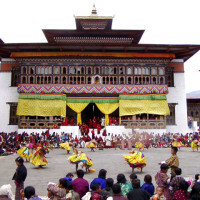 In addition to these festival, this tour covers highlights of Paro, Thimphu, Phobjikha, Wangdue & Punakha valleys, which are Bhutan’s most historic towns and districts. The pace of this tour allows you to fully absorb and appreciate the rich culture, and natural beauty of this peaceful kingdom without feeling that you are bused around. 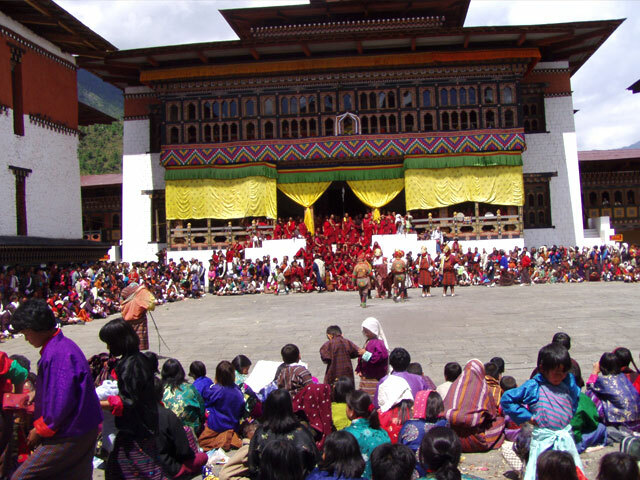 In the early spring, we attend Punakha Tsechu and Punakha Dromchoe. 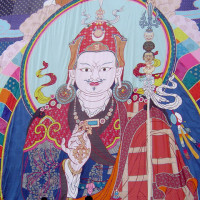 Bit later into main spring, we attend attend Talo village festival, along with the famous Paro Tsechu festival, where we also see the unfurling of giant Thangka. 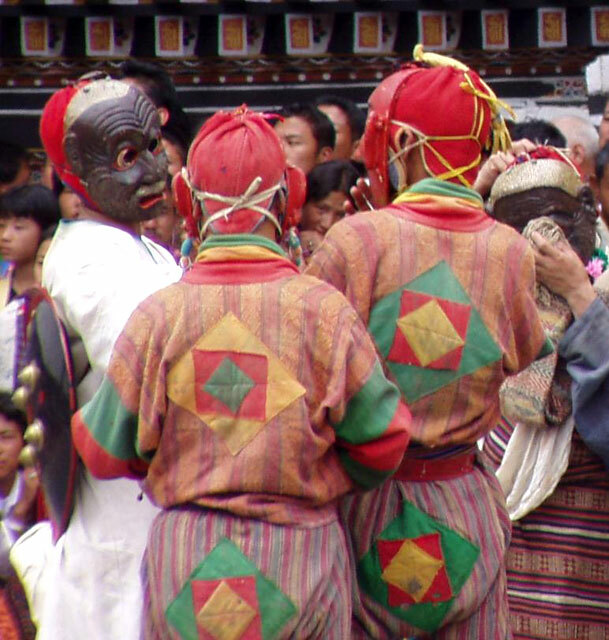 In the autumn, you’ll see three festivals of Wangdiphodrang, Gangtey and Thimphu tsechu festival. As these festival periods are extremely popular and therefore the flights and hotels tend to get booked out soon. 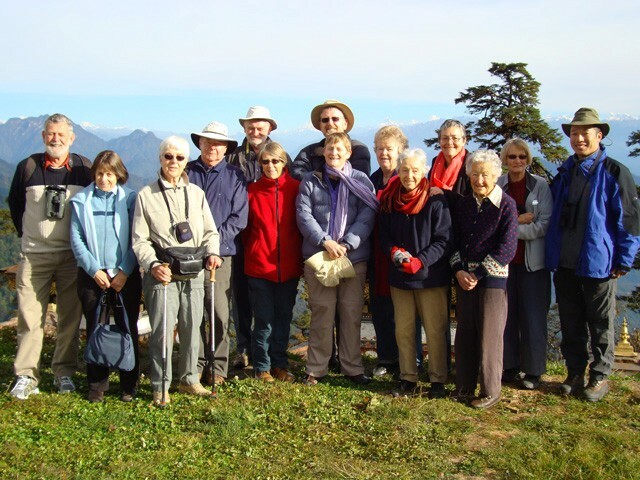 So plan and book early if you wish to join this exciting tour with small group travelers like you from around the world. Thimphu was established as the capital of Bhutan in 1961. Its population is around hundred thousand. It has a youthful exuberance that constantly challenges the country’s conservatism and proud tradition. The ever-present juxtaposition of old and new is just one of its appealing qualities. 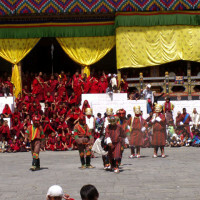 Crimson-robed monks, Indian labourers, gho- and kira-clad professionals and camera-wielding tourists all strolling on; and nobody, it seems, is in a hurry. 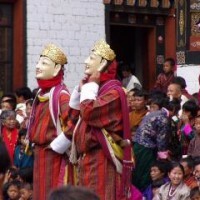 Thimphu is the world’s only capital without traffic lights. 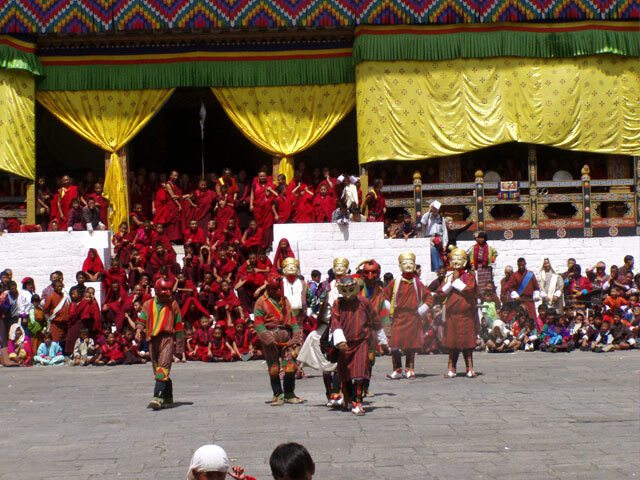 During your two full days, we will visit many monuments and attractions of Thimphu, including Tashicho Dzong, the farmers market, Gaint Buddha Statue, Memorial Chorten, Traditional Art School, Indigenous Hospital, Textile museum, Handicraft workshops and more. 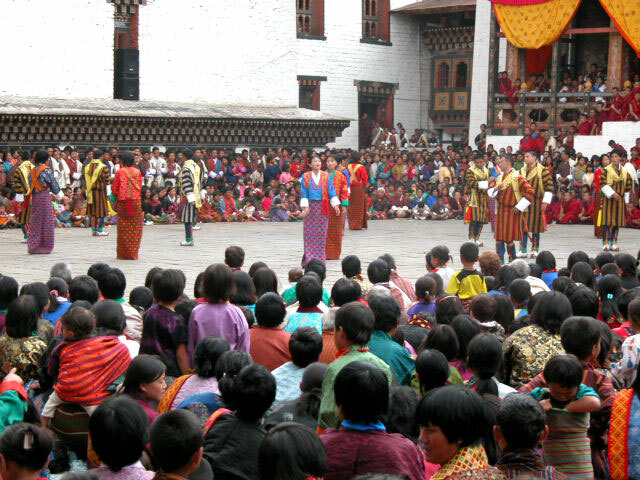 Thimphu offers the best opportunity to do your own thing. It’s relaxed, friendly and pretty informal, and is most rewarding if you can be the same. 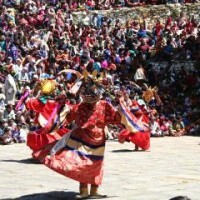 Wangdue and Punakha valley is reached by crossing spectacular Dochula pass. On a clear day, you’ll see panoramic views of snow capped peaks of eastern Himalayan range, including Bhutan’s highest peaks. 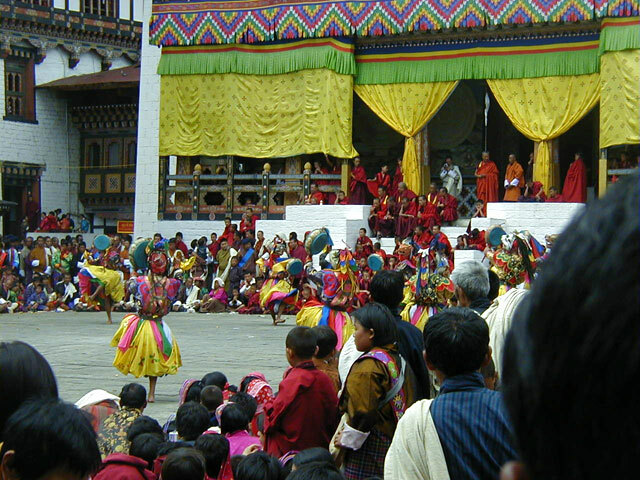 Punakha and Wangdue towns are located close to each other in one valley. 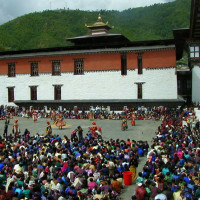 Punakha was the former winter capital of Bhutan and was established in this location, in part because Punakha is a warmer at a relatively low altitude of 4,100 feet (1300m), allowing for the production of two rice crops each year, along with growth of subtropical fruits such as oranges, mangos, and bananas. 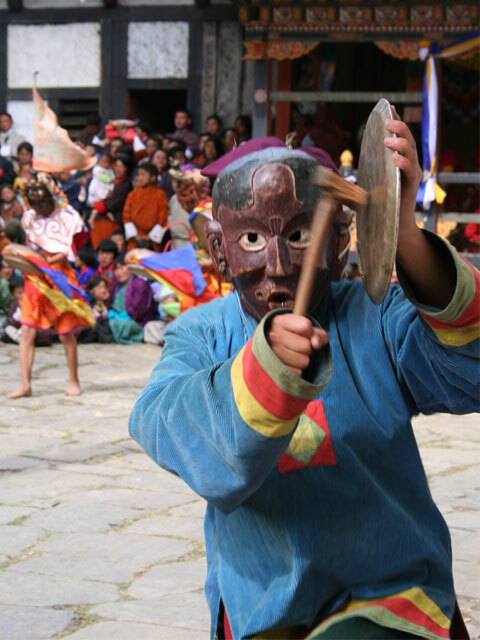 During our stay here, we will visit the impressive Punakha Dzong fortress located at the confluence of Pho and Mo Chu Rivers. We’ll take an easy walk in the valley, visit some of its monasteries, villages, take short drives and enjoy this idyllic countryside dotted with farm houses and terraced hillsides. Emerald green Paro Valley at 7,500ft, is one of Bhutan’s most beautiful and most fertile valley. Numerous shrines, fortresses and farm houses dot the landscape and graceful willow trees grow along the edge of Pachhu river, which passes through paddy fields and farmlands. During our time here, visit the ruins of Drugyal Dzong, a fortress which protected the valley against invaders from north. 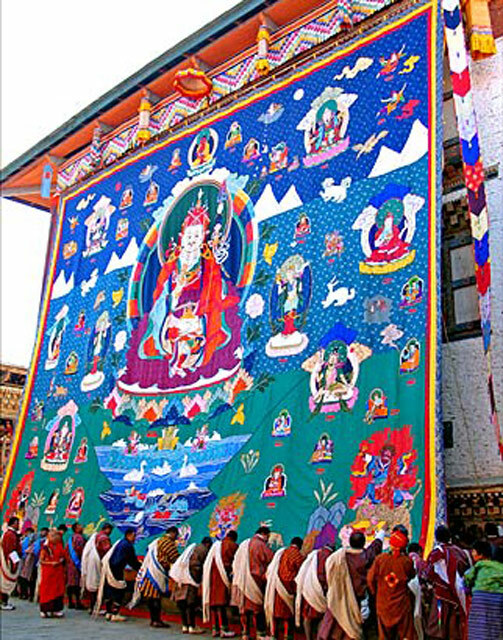 Visit beautiful 7th century Kichu Lhakhang temple, see many beautiful Buddhist wall paintings and iconography inside Dungtse Lhakhang, built in 1421. 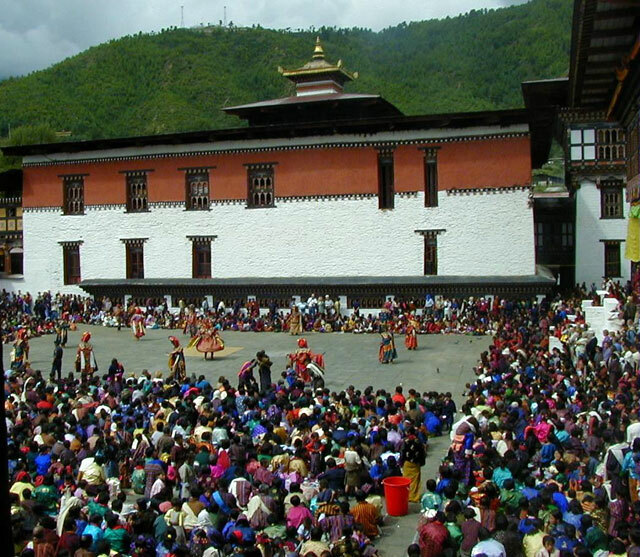 Among others you will also visit Bhutan National museum, housed in an ancient watchtower and visit Paro Rinphung Dzong, one of the most beautiful fortress /monastery in Bhutan. 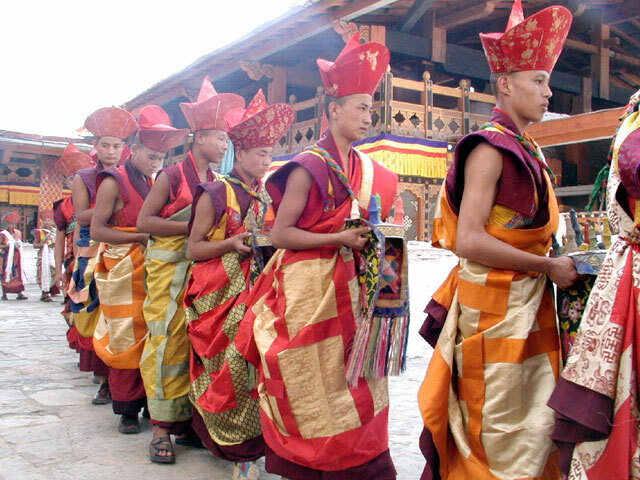 We also dedicate a full day for excursion to famous Taktsang (Tiger’s nest) monastery, an quintessential Bhutan travel experience. We can arrange pony ride for uphill part. Please note that itineraries are revised for each departures to incorporate local festivals and events. See next page for daily program. Transfer to the airport according to your departure flight schedule. Please note that the order of the itinerary, duration in each valley is altered based on the location of the festivals and events. For more information submit Request Detailed itinerary form. MealsAll meals including evening tea with snacks and also bottled water in the vehicles. Trip SeasonsThis group departure is placed to attend festival in Spring & Fall which also has great weather during the period. However for private tour it can be done throughput the year. Cost is Tiered based on the total sign-ups. Starting from $2190 Per Person plus airfares. Contact us for Detailed Tour Info & prices. 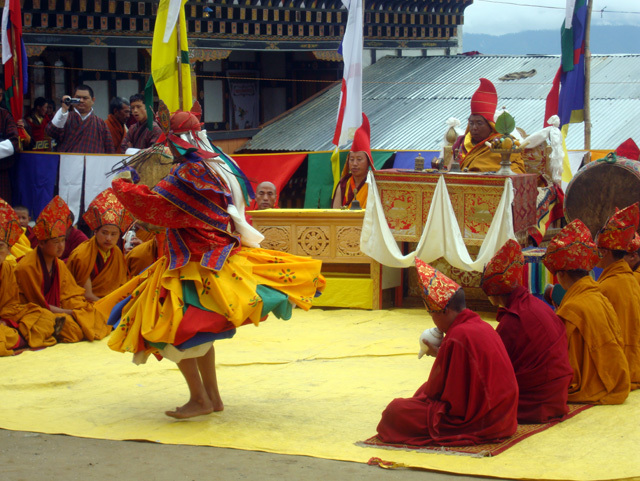 03 Oct, 2019 11 Oct, 2019 Attending Wangdue & Thimphu Festival Available Book now! Dear Anand, First, I would like to thank you and the entire staff of Wind Horse for the effort spent to set up our tours. We greatly appreciate the way that we were kept informed from the initial booking through our final departure. Your ground staff, both guides and drivers, were always well informed. In general both tours were very special as they took us to places that are hard to navigate and we were always visiting sites that we had only dreamed of seeing. Suggestions would be: 1. Try to do long drives every other day … not two consecutive days. On Day 2 we spent most of the day driving From Paro to Punakha. Very enjoyable with interesting stops along the way. Day 3 we were told that the drive to Gangtey would be rough (which we knew in advance) and that it would take 4 hours each way (not 3 as in the tour outline) which was going to leave almost no free time. The three of us discussed this and quickly decided that it was too much for one day and cancelled that part of the tour. I strongly suggest that if this is definitely something that should be included in the tour that it be done over two days (one day over and the second day back). One thing that could have been improved is meals (especially in Punakha and Paro) - it could have been nice to have more variety but was good enough for 9 days of the tour. 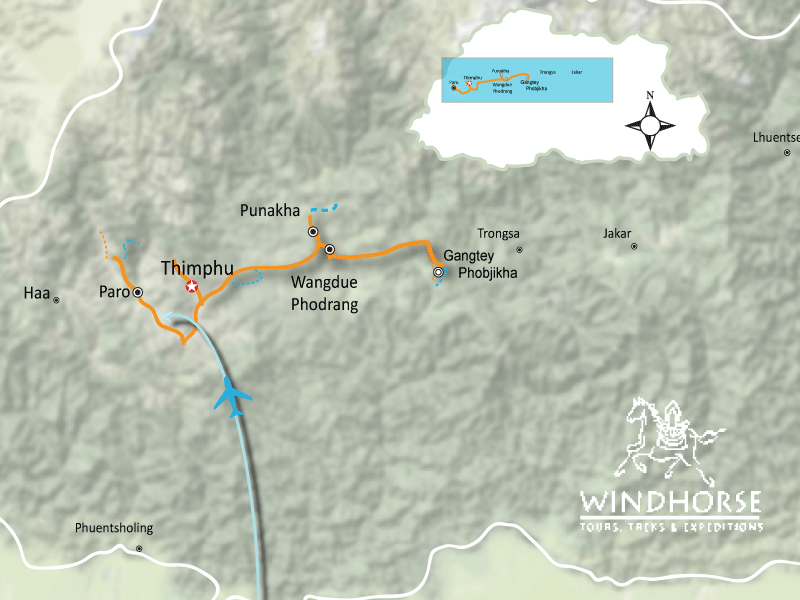 Overall, I would highly recommend the Windhorse for all of your travels in Bhutan, which is an excellent and trustworthy company. I would book other tours with them without any hesitation! Thank you, the Windhorse team for the superb trip! 5 " " Hi all, I hope that your travels went well! I echo MJ and Charlie, it was a great Bhutan trip, I'm very appreciative of the efforts by everyone at Windhorse! Hi all, I hope that your travels went well! I echo MJ and Charlie, it was a great Bhutan trip, I'm very appreciative of the efforts by everyone at Windhorse! 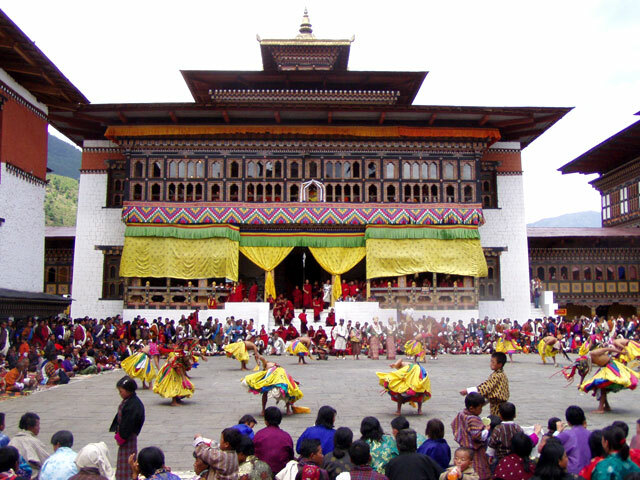 Wonderful Holiday in Bhutan Bhutan Festival Tour with Wangdi and Thimphu Festival, 2015 Hello to all - Charlie and I had a fantastic time in Bhutan. 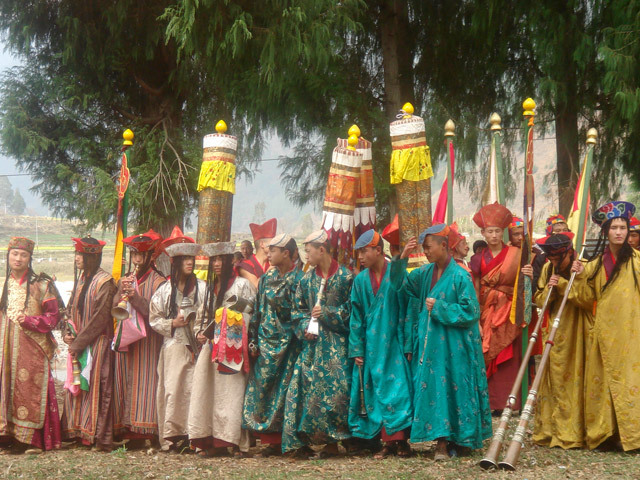 Bhutan Festival Tour with Wangdi and Thimphu Festival, 2015 Hello to all - Charlie and I had a fantastic time in Bhutan. One of our best trips ever!! We had wonderful fellow travelers and great guides and driver. Sonam, Tashi, and Barleyman made our trip very special.Hope everyone made it home safely - or hope you are enjoying continued travels. If you have some special pictures that came out extra good - please send them along to us at ......... Also - would love to hear about upcoming travel plans as travel is always of great interest to us. Again - it was wonderful meeting everyone. It was a wonderful holiday. Tashi was a wonderful guide on our private tour of tigers nest. I believe he took some pictures that day and it would be wonderful if he could forward those to us from his iPhone. Again - we loved the trip and will recommend Windhorse. 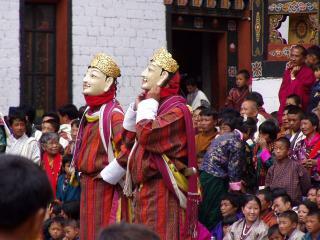 Still hope to some day return to Bhutan. I enjoyed my trip with Wind horse Travel immensely. The guide & driver were excellent. I am still amazed at how Rajeem(sp.) was able to provide safe & secure travel in spite of bumpy roads, traffic, construction delays, animals on the road, people on the road, etc. Penjour was outstanding as a guide. Whenever there was the smallest problem he seemed to appear out of nowhere to resolve it. 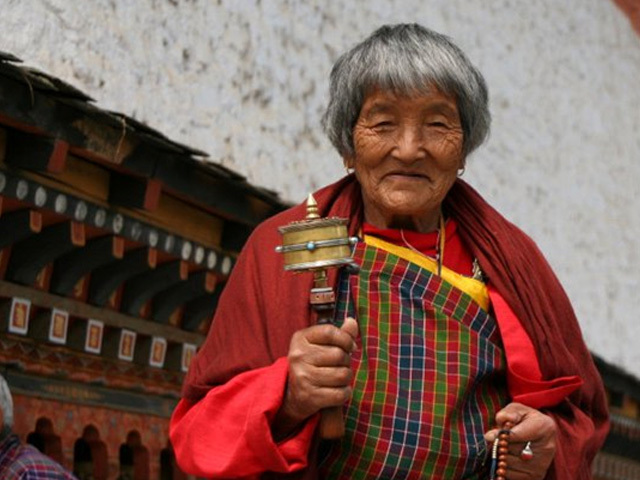 My favorite memories are of the interactions with the Bhutanese people - we stopped on the road to visit with schoolchildren, we met a young woman weaving at the Takin Sanctuary, watching the students work at the Art School, & watching the monks 'bless' your offices. This was unexpected & felt as if we had just 'stepped' into a part of your day. My favorite hotel was the Tashi Namgay Resort. It had the best location, the best food & an excellent staff. I had a soothing hot stone bath here that I recommend to anyone. 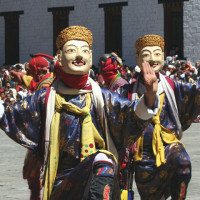 The National Museum, Paro festival & the Tatshang walk were highlights. Penjour was very helpful in guiding us through these experiences. If I were to visit again, I would add a small trek in the beginning to see a little more of the countryside. 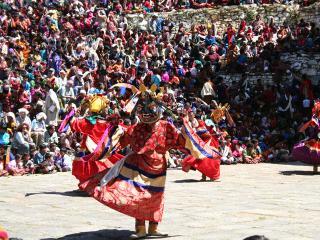 TID-621 (Bhutan Festival Tour (Talo & Paro Tsechu) 20th -28th March 2013 We just came back from Bhutan. 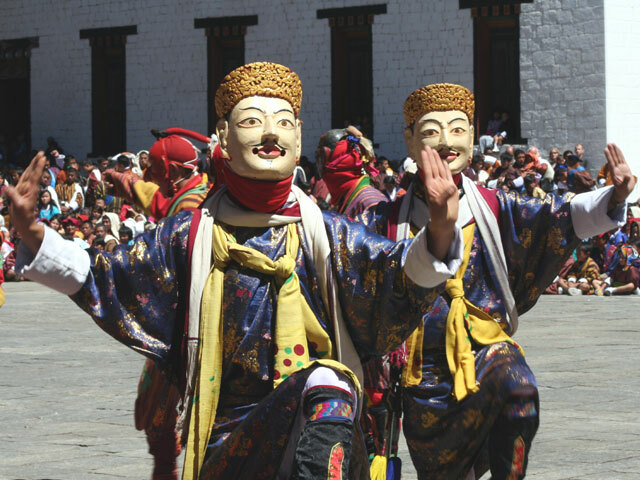 We were there for the Paro Festival, March 20-28, 2013. We had a great great time. Wind Horse Tour is reliable, well organized. We felt well taken care of, we felt save. 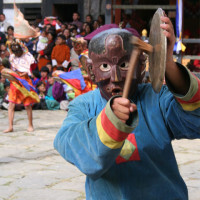 We loved everything and we will travel again with Wind Horse Tour, anytime. 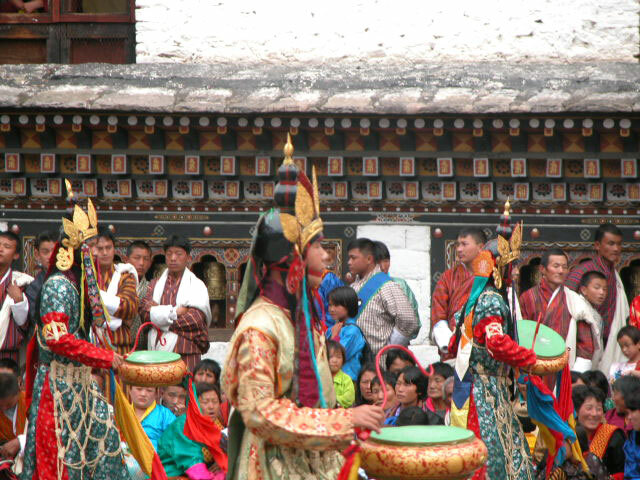 TID 621 Bhutan Festival Tour Dear wind Horse team, we just came back from Bhutan's Festivals trip, March 20-28th, 2013. We used Wind Horse Tours. And that was such a good idea!! Our guide first was more than charming, more than kind, more than knowledgeable:he was our best friend and companion for the all trip. Tashi was fantastic and we had so much fun because of him. He took us out every night when other tour guides would drop off their group to the hotel by 5pm, and still was on time every early morning. Poor guy ! He hardly slept with us!! We enjoyed every minute of our trip because of him. 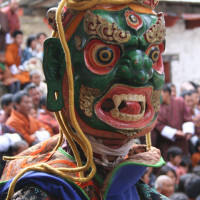 We loved Bhutan, its people, its culture, its landscapes, its monasteries and festivals, all incredible and unique in their own ways. We felt safe and welcome. Just a wonderful country to go to ..with Wind Horse Tours of course !! Amanda & Group Jambay Lhakhang Drup 2012 (Oct. 23-Nov 5th 2012) Dear Ugen and Jambay I would like to thank you and the team at Windhorse Tours for the fantastic experience that we had in Bhutan. The attention to detail from our guide and driver was exemplary. The tour was superb, more than meeting all my expectations. 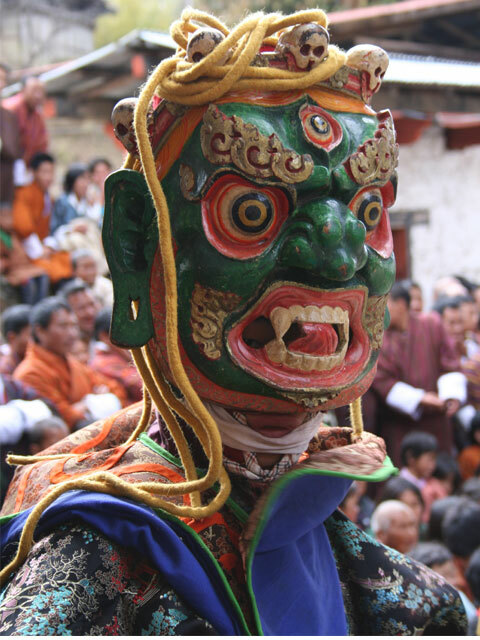 I have returned to England loving Bhutan as a country and the Bhutanese people. I do hope to return again, and soon. I would thoroughly recommend Windhorse and am happy to endorse both the professionalism of the organisation and the competence of its staff. 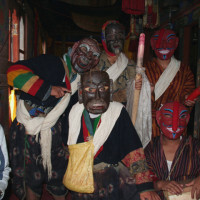 Of most importance was the the fun and enjoyment we had exploring Bhutan in the company of our guides. It made the tour an exceptional experience. I wish all the team at Windhorse well. Please do not hesitate to contact me if I can be of any further assistance. The sights were spectacular as were the 2 festivals we attended. Bhutan Festival Tour with Paro Tshechu Festival 2012 (March 31-April 8, 2012) Our trip to Bhutan was interesting, informative, and fun. Bhutan Festival Tour with Paro Tshechu Festival 2012 (March 31-April 8, 2012) Our trip to Bhutan was interesting, informative, and fun. The sights were spectacular as were the 2 festivals we attended. 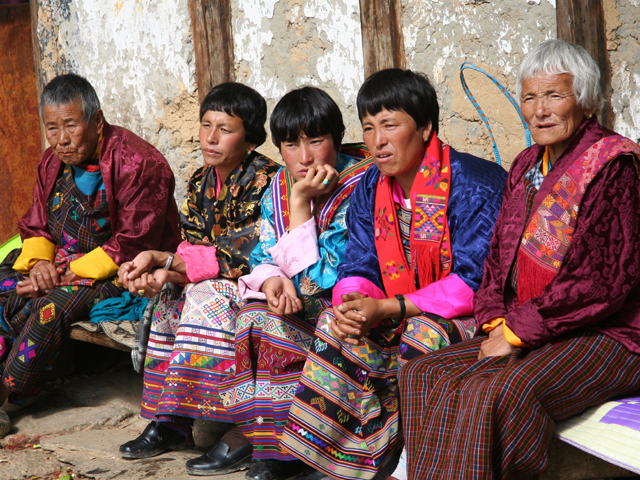 We all got a good insight into one of the last Himalayan kingdoms. Great weather, spring blossoms, beautiful decorative arts and much more. 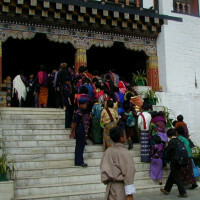 Last week I came back from a trip to Bhutan. But this story starts quite long ago ... In 2001 I visited Nepal where I met an Italian couple. 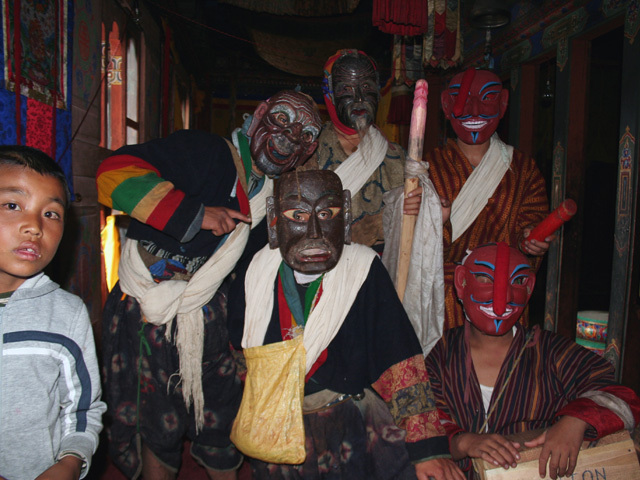 They told me that while they were going to Kathmandu they had a problem with the plane and had to land in Bhutan. 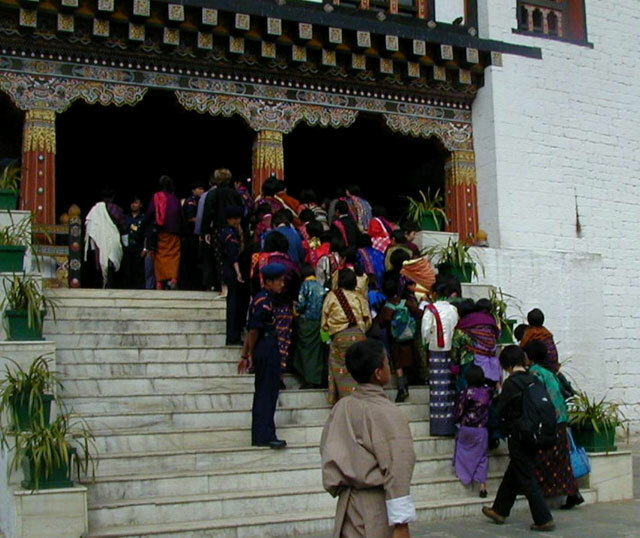 They were not allowed to exit the hotel where they were hosted but I remember them saying: “We want to visit Bhutan one day" I asked myself how Bhutan could be if they wanted to go back just because they enjoyed it from the window of the hotel room. 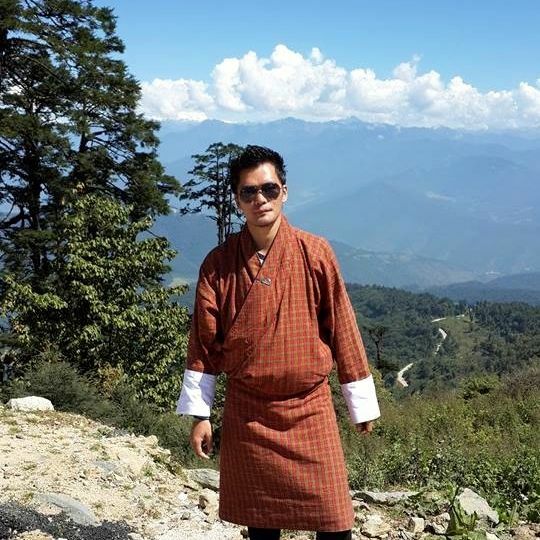 It was then when I decided to visit Bhutan myself one day. During these years, I tried three of four times to book a trip but for a reason or another I never made it. Ten years later, I got in touch with Ugen and Jambay, from Wind Horse Tours. In a very short time (very few weeks), they sent me the itinerary, the quote, made all the bookings and arranged my visa. They were effective, prompt in replying, professional and precise. A week prior my leaving Italy I had everything I needed to start a dream of a whole decade. 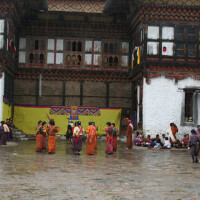 I travelled Bhutan through 8-19 May 2011 with my guide Tenzin Rabgay and driver Hem. I enjoyed every moment I spent with them. Once the program of the day was done, we took time to talk, laugh, tell stories, drink a beer, have dinner together, hike, walk and meet with other buthanese people. I never felt unsafe or neglected. My guide and driver were always punctual and I never had to wait for them, even when I appeared suddenly because I wanted to leave a place or I woke up earlier that morning and had breakfast before scheduled time. They were simply there. With only one exception, accomodations were clean and comfortable, while the staff was helpful and polite. Sometimes even to polite that I felt embarassed because I am not used to such a kind of treatment. I took the Country as it is. For a western traveller, not everything can meet every single expectation. Even if it could be hard to believe, I have nothing to complain with. 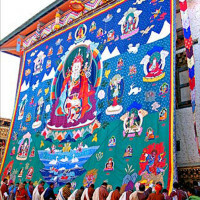 I just enjoyed the trip, even the bumpy roads, but especially Domkhar and Ura festivals I had the chance to attend. 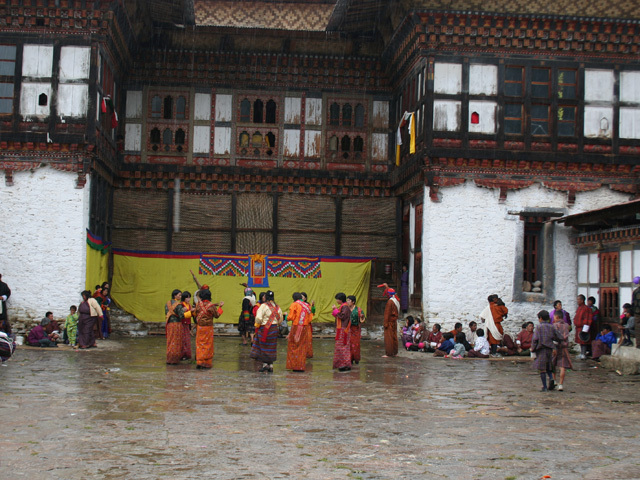 Punakha and Bumthang were absolutely a wonderful place to stay. The hike to the Tiger’s Nest very charming. And the walk I took in Gangtey after a heavy rainfall was really fun, especially when we got into the mud till our ankles! I travelled a few other countries in Asia, which is a place I always love to go back to. 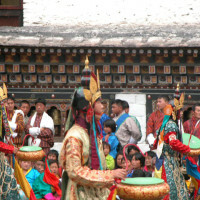 Bhutan is unique and Wind Horse made it special. Many thanks first to Jambay, who did a great job, Ugen who is the first I got in touch with and all the staff who worked backstage. Finally my gratitude goes to Rabgay and Hem, my two Guardian Angels. 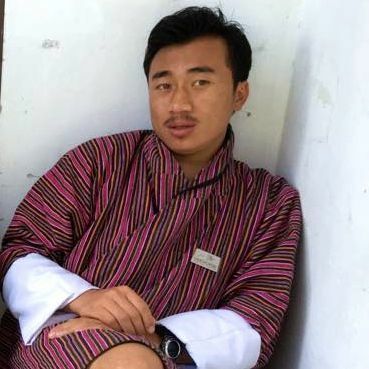 Hope to meet you again in Bhutan. 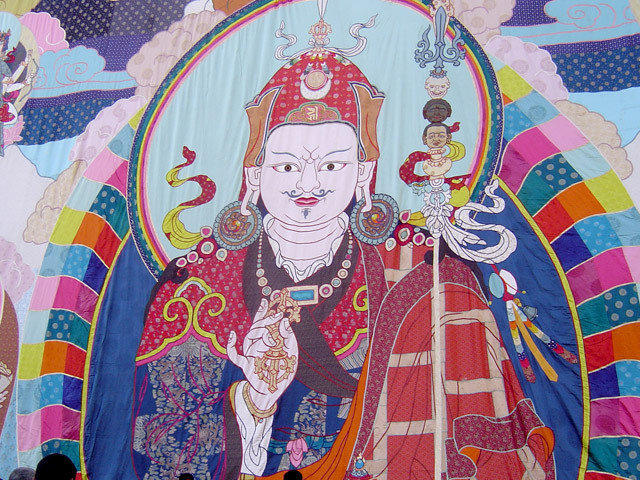 Tashi delek ! 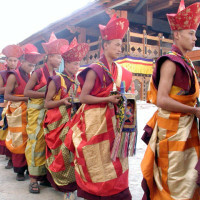 TID196: Bhutan Tour from 15-21 Nov, 2008 Hello Ugen, Wanted to let you know that we had a wonderful journey to Bhutan. 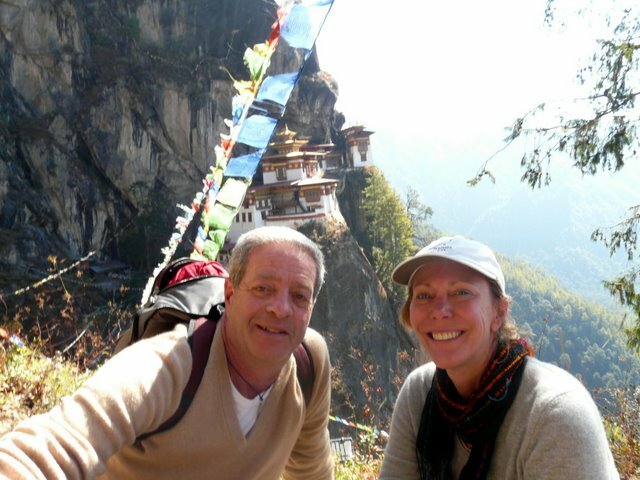 We were given a great tour by Jambay and Kinga and his associate took us for a delicious meal in Thimphu. If you like I can send you a website to see pictures from the trip. Take care of yourself. It was a terrific experience. Sincerely, Gloria S.
5 " " Petchprapa Family Tour of 4 from US & Thailand April 2009 Dear Ugen, We had an absolutely wonderful trip. Your guide was very accommodating and made our trip very pleasant! Petchprapa Family Tour of 4 from US & Thailand April 2009 Dear Ugen, We had an absolutely wonderful trip. Your guide was very accommodating and made our trip very pleasant! TID 140: Private Bhutan Tour (Oct 6-21,2008) Hello Ugen, Jacquie and I both agreed this trip to Bhutan was one of our all time favorites. 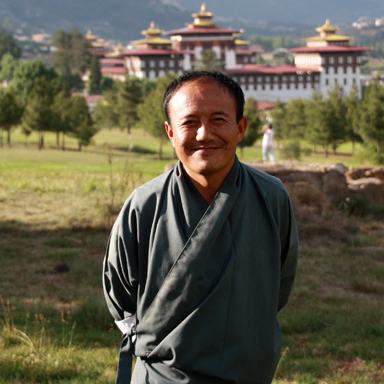 We loved our guide, Tshewang Rinchen and our driver Rincen. Tshewang did everything he could to make our trip memorable. He will be a lifetime friend for us. We will gladly recommend your tours to our friends. Thank you for the all the new memories and experiences. We can't wait to get our photos developed and on c.d.'s. What a wonderful country you come from!! Kuzuzungpola!!!! Fabulous, superb, masterful!!! We had a marvellous journey! 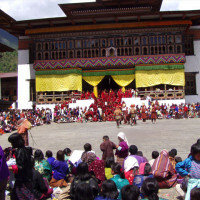 And after my third trip to the Royal Kingdom, Bhutan remains the best place on earth!Peldan and Guddu were true joys to travel with!With most of the Bhutanese running with high expectations for"2008," we'll look forward to returning with Windhorse then. 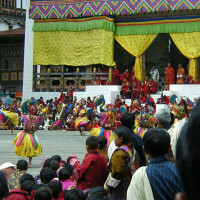 5 " " Bhutan Paro Festival Tour, Mar 2008 We are adjusting to the time difference and wanted to let you know that we had a great trip. I would reccommend not to schedule the Tiger's Nest hike the second day itself as most would prefer to have time to adjust to the altitude. 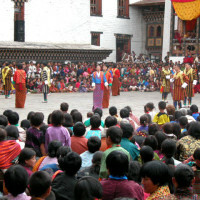 Bhutan Paro Festival Tour, Mar 2008 We are adjusting to the time difference and wanted to let you know that we had a great trip. I would reccommend not to schedule the Tiger's Nest hike the second day itself as most would prefer to have time to adjust to the altitude.